Be sure to adjust mirror angles before driving. 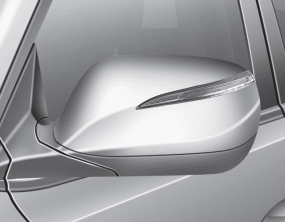 Your vehicle is equipped with both left-hand and right-hand outside rearview mirrors. The mirrors can be adjusted remotely with the remote switch. The mirror heads can be folded back to prevent damage during an automatic car wash or when passing in a narrow street. The right outside rearview mirror is convex. Objects seen in the mirror are closer than they appear. Use your interior rearview mirror or direct observation to determine the actual distance of following vehicles when changing lanes. Do not scrape ice off the mirror face; this may damage the surface of the glass. If ice should restrict movement of the mirror, do not force the mirror for adjustment. To remove ice, use a deicer spray, or a sponge or soft cloth with warm water. If the mirror is jammed with ice, do not adjust the mirror by force. Use an approved spray de-icer (not radiator antifreeze) to release the frozen mechanism or move the vehicle to a warm place and allow the ice to melt. Do not adjust or fold the outside rearview mirrors while the vehicle is moving.This could result in loss of control, and an accident which could cause death, serious injury or property damage. The electric remote control mirror switch allows you to adjust the position of the left and right outside rearview mirrors. 1. Place the ignition switch in the ON position. 2. 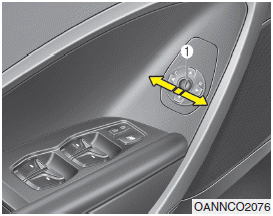 Move the lever(1) to R (right) or L (left) to select the right side mirror or the left side mirror. 3. Press a corresponding point on the mirror adjustment control to position the selected mirror up, down, left or right. 4. After the adjustment, position the lever in the center to prevent inadvertent movement. Do not attempt to adjust the outside rearview mirror by hand. Doing so may damage OANNCO2076 the mirror. To fold outside rearview mirror, grasp the housing of mirror and then fold it toward the rear of the vehicle.